Nicola Lees appointed curator of the 31st Biennial of Graphic Arts in Ljubljana. Since 2013, Nicola Lees has been the curator for Frieze Projects, the annual not-for-profit programme featuring artist commissions, film, and music at Frieze London. Nicola was previously Senior Curator of Public Programmes at the Serpentine Gallery, London, where she oversaw interdisciplinary, time-based and performance projects, artist commissions, initiating Park Nights and the Serpentine Cinema series, and realizing the Serpentine Gallery Marathon (co-curated with Hans Ulrich Obrist). In 2007 she curated the exhibition Left Pop Bringing it Home at the Second Moscow Biennale of Contemporary Art and worked on key solo exhibitions by Alex Katz, Miroslaw Balka, and a group exhibition with Philippe Parreno at the Irish Museum of Modern Art. The 2015 biennial, Over you/you, takes its starting point from a scribble in the corner of one of Martin Kippenberger’s drawings, and will bring together traditional, and not so traditional, forms of graphic art production, posing them as sites within which political and aesthetic agency find common ground. Traversing historical and contemporary tendencies that reject the strict and reductive terms of the discipline, Over you/you will gather practices that foreground the graphic arts’ more radical gestures; exploring the shifting nature of the network and forms of dissemination. 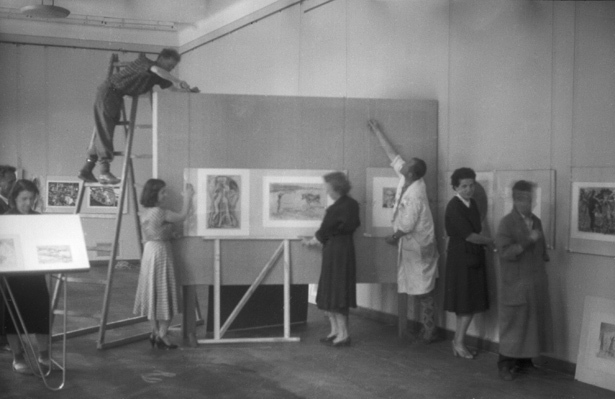 Image: Installing of the 1st International Exhibition of Graphic Arts, Moderna galerija, Ljubljana, 1955. Courtesy Moderna galerija, Ljubljana.